As Catholic Health makes investment decisions and initiates capital projects, they have the data necessary to proceed with confidence. The framework and tools provided by The Innova Group team support a system view with a visual dashboard for quick reference and are easily updated. To provide Catholic Health, a 5-hospital system, formed through recent mergers, a means to understand and leverage their evolving physical assets, the team of The Innova Group and CallisonRTKL, assessed the acute care campuses, advised on near-term projects, and began creating a comprehensive, system-wide facility master plan. 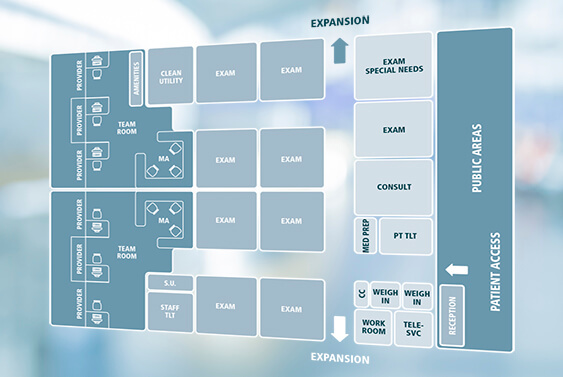 The team developed detailed physical and functional assessments to create a baseline understanding of each campus and then populated comparison charts at building and service area levels to illustrate things like: the health of the system infrastructure, areas stressed by volume and those suffering from insufficient space. The team also created a capital investment catalog to garner a better understanding of deferred maintenance, and historic and planned strategic capital investment. In addition to informing strategic capital planning, the assessment provided Innova essential information to guide proposed design options for everything from adding ORs to implementing public wayfinding scenarios to inpatient unit reconfigurations. The comprehensive nature of the assessments limited the unknowns during design and provided insight that allowed multiple challenges to be solved by each individual project.